Since its beginning in 1999, the Foundation has been systematically incorporating all Roy Lichtenstein studio records, dealer and auction records, and any other source materials to compile the comprehensive catalogue raisonné of the artist’s work. This catalogue will illustrate every confirmed work and publish, in chronological order, all known paintings, sculptures, drawings, prints, commissions and other artworks by Roy Lichtenstein. The artist produced approximately 5,000 works during his lifetime (not counting the full edition runs of prints or multiples). The earliest works date from c. 1940 and the latest, 1997, plus a limited number of posthumous sculpture casts and prints. The catalogue raisonné will incorporate physical details, inscriptions and marks, and preparatory studies as well as provenance and new biographical, bibliographical and documentary information. Studio process and other contemporary photographs will provide additional documentation. 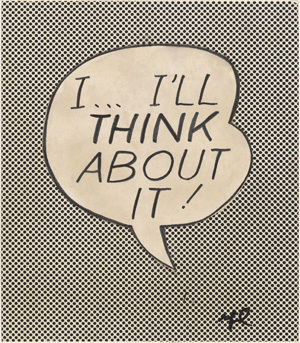 The entire Roy Lichtenstein catalogue raisonné will be published online; a special print publication will follow. A first publicly accessible presentation of basic information can be found on our temporary catalogue website: www.imageduplicator.com. The Foundation has contracted distinguished art historians as independent researchers. They and the Foundation staff, centralized through the Foundation’s catalogue raisonné director, Andrea C. Theil, continue to amass baseline information for all known Lichtenstein works. Current key staff and outside researchers/consultants are Crystal S. DeRubbio, MA (Catalogue Raisonné Associate), Shannon Mulshine, MA, MS (Catalogue Raisonné Associate), Avis Berman, MA (Researcher), Catherine Howe, MA (Researcher), Andrea Foggle Plotkin, PhD (ABD) (Researcher), Bettina Utz (Media Consultant), Christine Dawson (Data Management), and Penny Kelleher, MLS (Data Management). Ongoing support is provided by the Roy Lichtenstein Foundation and Estate staff. Previous researchers were (in alphabetical order) Kate Aspinall, Graham Bader, Karen Bandlow, Clare Bell, Jack Cowart, Eileen Doyle, Alison Green, Gillian Kane, Kathy Kienholz, Sarah Lowe, Justine D. Price†, Julie Reiss, Sid Sachs, Susan Solomon, Yolande Trincere, Nadia Tscherny and Laural Weintraub. Prior coordination was provided by the Foundation’s previous registrar, Natasha Sigmund, and previous managing director, Cassandra Lozano. Many photographers and institutions have contributed photography to the Catalogue Raisonné. For a continuously updated list please follow this link. In June 2002 an updated and revised catalogue raisonné of the prints of Roy Lichtenstein, authored by Mary Lee Corlett and Ruth Fine, was published in association with the National Gallery of Art, Washington, D.C., and Hudson Hills Press. This print and multiples information will eventually be incorporated into the Foundation’s inclusive catalogues. However, to avoid redundancy, the Foundation is not currently pursuing print documentation. The Foundation continues to gather images, references and material on artworks by Roy Lichtenstein in private and public collections. To submit information, please download a PDF of the catalogue raisonné collector’s form or e-mail us at info@lichtensteinfoundation.org. All information associated with the ownership of works of art in the catalogue raisonné is strictly confidential, and wishes for anonymity will be fully respected. The Roy Lichtenstein Foundation does not authenticate works of art. The Foundation’s website, and its related subsite, www.imageduplicator.com, contain the works that are known to the Foundation and which the Foundation believes are works by Roy Lichtenstein.